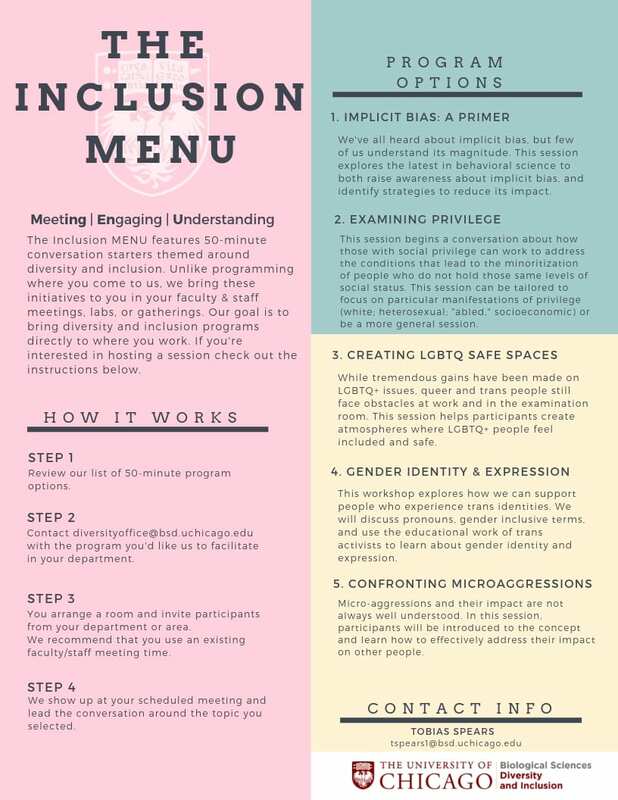 The Inclusion MENU features 50-minute conversation starters themed around diversity and inclusion. Unlike programming where you come to us, we bring these initiatives to you in your faculty and staff meetings, labs, or gatherings. Our goals is to bring diversity and inclusion programs directly to where you work. If you’re interested in hosting a session check out the instructions below. Step 1: Review session descriptions below. Step 2: Contact diversityoffice@bsd.uchicago.edu with the program you’d like us to facilitate in your department. Step 3: You arrange a room and invite participants from your department or area. We recommend that you use an existing faculty/staff meeting time. Step 4: We show up at your scheduled meeting and facilitate the conversation around the topic you selected. We’ve all heard about implicit bias, but few of us understand its magnitude. This session uses the latest in behavioral science to educate you about implicit bias and the tactics you can use to reduce its impact. This session is recommended for those involved in recruitment. While tremendous gains have been made in LGBTQ+ access, like marriage equality and health equities, queer and trans people continue to face obstacles in the workplace and in the examination room. This session helps participants create atmospheres where LGBTQ+ people feel included and safe. This session begins a conversation about how those with social privilege can work to address the conditions that lead to the minoritization of people who do not hold those same levels of social status. This session can be tailored to focus on particular manifestations of privilege (white; heterosexual; socio-economic; and “abled”) or be a more general session. This workshop is focused on being better practitioners for people who experience trans identities. We will discuss pronouns, gender inclusive terms, and use the educational work of trans activists to learn about gender identity and expression. Microaggressions and their impact are not always obvious or well understood. This session explores practical tools to help address them. Participants will be introduced to the concept of micro-aggression, and learn how to address them.